Based on the tribe culture, the Na-row literature becomes to boom. 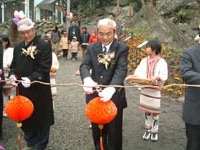 Mr. Chen returned to the Jun Pin elementary school at Na-row tribe in Jianshih Township, Hsinchu County, and he mentioned the tribe recreation to Atayal-natives. This is the first issue about mind recreation after Aere typhoon. the ROC Careernet Association help Mr. Chen raise funds to millions of dollars to build the first literature house at the Frog stone hotel in Jin Pin village. Such situation is similar to those of 25 years ago. to worked at the Yu Fone elementary school as a supply teacher on the second year. During the-two-year mountain life, he is impressive, and release tens of books about the Na-row culture to introduce the beauty of Na-row. "The literature is the best pill for curing broken heart" said Mr. Chen. 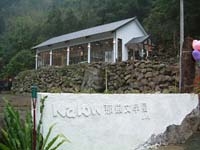 The dream of building the Na-row literature house was produced before Aere typhoon. In last year, Mr. Chen finished building the first literature passway. After Aere typhoon, the passway was destroyed. When Mr. Chen came there, he cried intensely. "Especially after Aere typhoon, I hope to fulfill my dream" said Mr. Chen. The literature house is a symbol for the Taiwanese-natives. Consequently, he knew the chairperson from the ROC Careernet Association to lead them to travel in the humanity of the Jianshih tribe. Liu Ming Chung, the president from Taichung Ming Wei Paperware Machinery Company, subscribe one million dollars to build the literature house. The Na-row literature house is located at the left side of the Frog Stone Hotel. The ownership provides a part of lands which is used to be as the literature garden. Due to one million dollars, the literature house was started to build. Yesterday, the tribe classroom was used, and Mr. Chen talked to his students about the creating minds and the learning tribes. The former students came back to "go to school." The Na-row literature house is designed with the idea of glass, and includes the literature garden featured some articles and books by Mr. Chen; therefore, he launched the tribe natural environment, literature, and outdoor learning, plus some tribe singer the Atayal songs. The writers enjoying the Na-row have their own paradise, including the A-ya track, the ecology pool, and flower gardens.